One thing I received for Christmas, only late, was my great Aunt Nelle's clock. My dad found it when he started cleaning out the garage/attic. He knew I would love it. He took in it to the clock place and had it fixed. And can I ask, any of you out there that have had your clocks worked on, does time just stand still in those places? Asking because it appears you just do not get a in a hurry in those places. My great aunt Nelle. Born Nellie Catherine Bunyan on October 23, 1885 in Kansas, I believe, to Charles Sylvestor Bunayn and Mary Ellen Root. She first married Frank Jennings. An attorney turned train robber. He was put in prison in Kansas, while his brother Al, was in Ohio (with Sidney Porter, better known as O'Henry). Seems Mr. O'Henry got Frank and Al an audience with Teddy Roosevelt and they were pardoned (technicality--- they did not rob the train as the charges stood against them, they robbed the passengers). They had one daughter that died in infancy and then a son, Frank Jennings Jr. I am not sure when she divorced him, but he went to prison around 1897. She went on to marry L.W. Hardwick in Tulsa, OK. She actually wrote a book -- "The Woman's Handbook to Voting". My dad has the original copy. She died in June of 1965, so I never got to know her. But from what I understand, she was always made up - hair always done, makeup always perfect. Even when she was in her 70's. Quite a woman. and I thank her for the magnificent clock too! I really need to get all of my genealogy things together and make scrapbooks for the family. I just have so much information, it is crazy! Hello, I found the above piece about your Great Aunt, to say the least, fascinating. I am trying to gather information on any and everyone related to AL JENNINGS for a forthcoming biography. I would love to gather more information, photos, facts, dates, any and everything that you can share. Please contact me at: Kevin John Charbeneau on aol.com KC122060@aol.com or by post to ENGLAND. PS, your clock is lovely too. If only time could go backwards and I could hear what your Great Aunt had to say about AL and FRANK. clocks are so special! how wonderful to have something so special and so lovely. : ) and yes, every clock repair shop takes *forever* to finish! i have a collection of clocks, a few very similar to yours, and always it takes about 2 months to get them back. i guess time does stand still at the clock shop! Hi. I find your blog to be so warmhearted and interesting. Fascinating what you're finding in that attic! What an awesome clock! 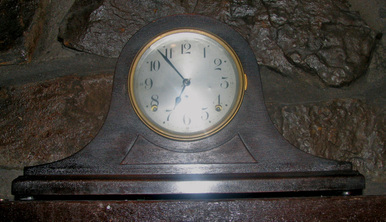 I've always wanted a round mantle clock--they always seemde to pop up in pictures in the children's books from the 1940s that I used to read, and I just love the look of them. A very cool slice of family history there, too!